It’s National Apprenticeship Week, so what better time to blog about our experience so far as HMRC Digital Apprentices. 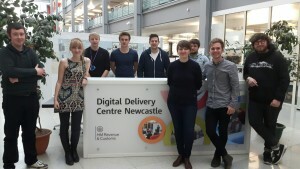 We’re a group of 9 Software and Test Engineer Apprentices working in the HMRC Digital Delivery Centre, Newcastle. When we first arrived in the Digital Delivery Centre back in September 14, feeling both nervous but exhilarated, we were told reassuringly that we ‘wouldn't be the newbies for long’. That turned out to be true as fresh faces appeared on a frequent basis as the Centre grew and evolved, after all, it was only a few months old at the time. For a few of us apprentices, this was our first professional job having just left college, so needless to say the on-boarding process was slightly daunting. Having said that, we all found with the Digital Delivery Centre being so new, every member of staff was still finding their feet. We all helped each other get settled in what we think is one of the greatest working environments in the public sector. We take part in a series of exciting and interactive work-related challenges between now and the end of April. The aim is to develop new skills and showcase our work as an employer by engaging with young people and businesses to promote the benefits of apprenticeships. We also have to complete a Community Project and organise activities (like doing this blog) to raise the profile of the team, our employer and apprenticeships themselves. It was tough deciding on our community project. Ultimately, we felt that as Digital apprentices we wanted to showcase the world of digital and technology to our community's young people. So we’ve arranged to help a local Scout group achieve their badges in Digital Citizen and Digital Maker. Teaching them how to use the internet for research, prototype a game using a suitable tool and create a fully functioning website plus much more. We all feel very lucky to be in HMRC Digital where we can work alongside some of the most talented and experienced IT professionals in the industry. We’re making the most of it and learning as much as we can, while giving back to a younger audience ourselves, teaching digital skills or simply encouraging them to consider an apprenticeship. Great ideas all round and good luck with the competition!! Good luck guys, youve come a long way since you started. Good luck guys! The Civil Service fast track apprenticeship programme is a fantastic programme and there has been some great talent coming through the doors as a result. And we need more, across our growing national distribution of digital delivery centres. I work in the Yorkshire Digital Delivery Centre, currently in Leeds, and we are definitely on the look out for some great apprentices! !